Acknowledged author Trevor Hastie wrote An Introduction to Statistical Learning: with Applications in R (Springer Texts in Statistics) comprising 426 pages back in 2013. Textbook and etextbook are published under ISBN 1461471370 and 9781461471370. 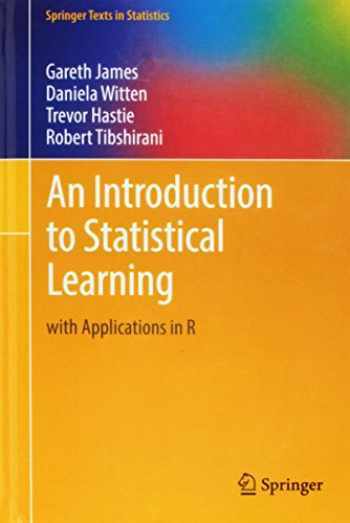 Since then An Introduction to Statistical Learning: with Applications in R (Springer Texts in Statistics) textbook received total rating of 4.5 stars and was available to sell back to BooksRun online for the top buyback price of $23.87 or rent at the marketplace. An Introduction to Statistical Learning provides an accessible overview of the field of statistical learning, an essential toolset for making sense of the vast and complex data sets that have emerged in fields ranging from biology to finance to marketing to astrophysics in the past twenty years. This book presents some of the most important modeling and prediction techniques, along with relevant applications. Topics include linear regression, classification, resampling methods, shrinkage approaches, tree-based methods, support vector machines, clustering, and more. Color graphics and real-world examples are used to illustrate the methods presented. Since the goal of this textbook is to facilitate the use of these statistical learning techniques by practitioners in science, industry, and other fields, each chapter contains a tutorial on implementing the analyses and methods presented in R, an extremely popular open source statistical software platform.Two of the authors co-wrote The Elements of Statistical Learning (Hastie, Tibshirani and Friedman, 2nd edition 2009), a popular reference book for statistics and machine learning researchers. An Introduction to Statistical Learning covers many of the same topics, but at a level accessible to a much broader audience. This book is targeted at statisticians and non-statisticians alike who wish to use cutting-edge statistical learning techniques to analyze their data. The text assumes only a previous course in linear regression and no knowledge of matrix algebra.